I had a phone full of screenshots...things I've seen online that I had every intention of going back to have a second look at, blog ideas, images from Pinterest etc etc. There were some forgotten treasures in that little lot, lost between selfies and pictures of my nephew! 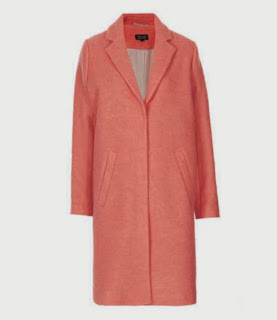 So, first 'POTW' goes to an item that fell back in favour this week (mainly due to the intense drop in temperature), the Zara blush coat that I purchased back in the Spring and featured here! Heels - Valentino as featured here. Wool Boyfriend Coat, buy here. I cannot cope with the thought of even having an iPhone...let alone updating the beast!! They'll have to rip my Blackbizzle from my cold dead hands (although the company'll probably be cold and dead quite a bit before then). speaking of which....any vouchers in your life yet? No news at all on the vouchers... My wish list is up to about £300 after a trip there today!! Oh I've dusted off this ZARA coat for this year too - I still love it.